Tomorrow's Thanksgiving! I'm really excited! I am planning on getting drunk off of tryptophan (you know, that weird stuff in turkey that makes you sleepy). However, there won't be any time for napping because, well, I have a confession. You see, I am going to attempt to steal a whole pumpkin pie, just for moi. Why don't I just bake one for myself, you ask? Because. I'll be relaxing all day while other people slave over the stove. So, back to my plan. What if...I sabotage the pie by "accidentally" dropping it on the floor. But, then again, that probably wouldn't be the best idea because who wants to eat pumpkin pie off the floor? Granted, I would. But I think I have a better idea. What if, I take a bite out of the pumpkin pie, abruptly spit it out onto the table and scream really loud, "EW!! This is just AWFUL!" Yep, pretty sure no one will want to eat it after that. And then I will laugh, having fooled all of my family on Thanksgiving, and I will go sit in a room by myself and devour that delicious pie I waited all year for. And then I'll blame it on the tryptophan. Happy Thanksgiving. Peace, love and pumpkin pie. Happy Thanksgiving! I love the fall colors in ur outfit! Pumpkin pie for the win :) Nice fall colors! I'm smitten by your sweater! 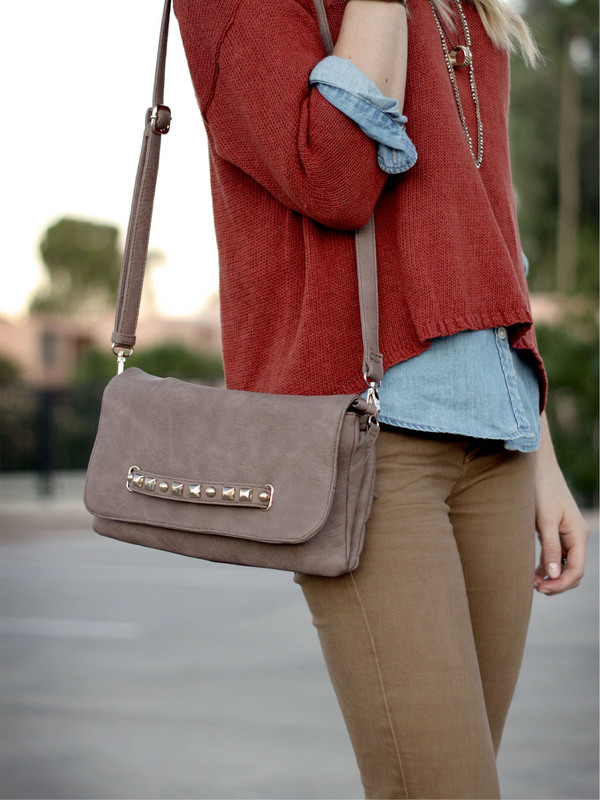 Love the color and oversized style. Craving pumpkin pie, enjoy it! mmm, love me some good pumpkin pie. Wow! A lot of thought has gone into stealing this pie - I hope it works out for you! Great autumnal outfit there. hahaha I love that plan! Happy Thanksgiving Katie! Hope you'll have a tasty pumpkin pie for the occasion! 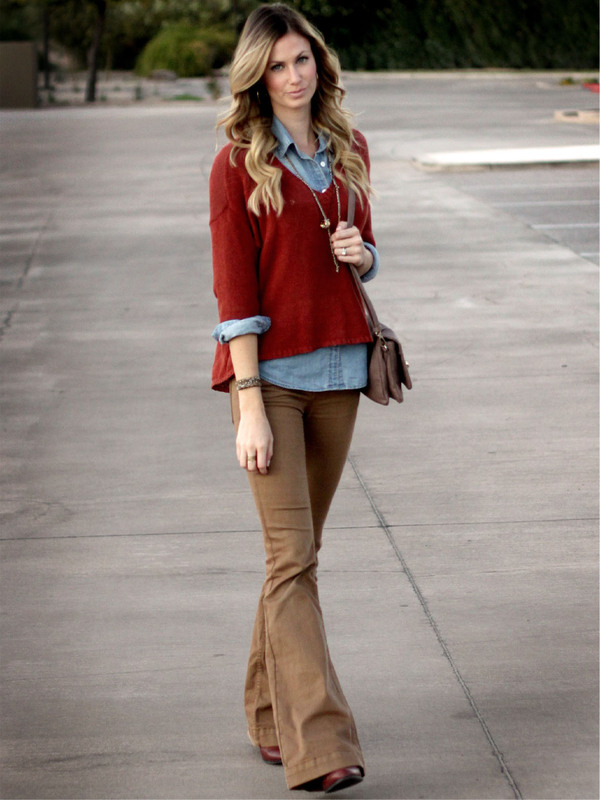 Great outfit by the way it makes me thin of the 70s and college look. And thank you for the "self-portrait tips" post of the other day I found it very useful! I love that you put so much effort into concocting elaborate schemes to have pumpkin pie all to yourself... certainly more fun than just making one from the can. :) Happy Thanksgiving! * high five. I will definitively sit with you in that couch and eat the whole pumpkin pie after we fooled out families. *laughs By the way you look adorable in that outfit. I hope you had a great thanksgiving! I'm in love with this bag. 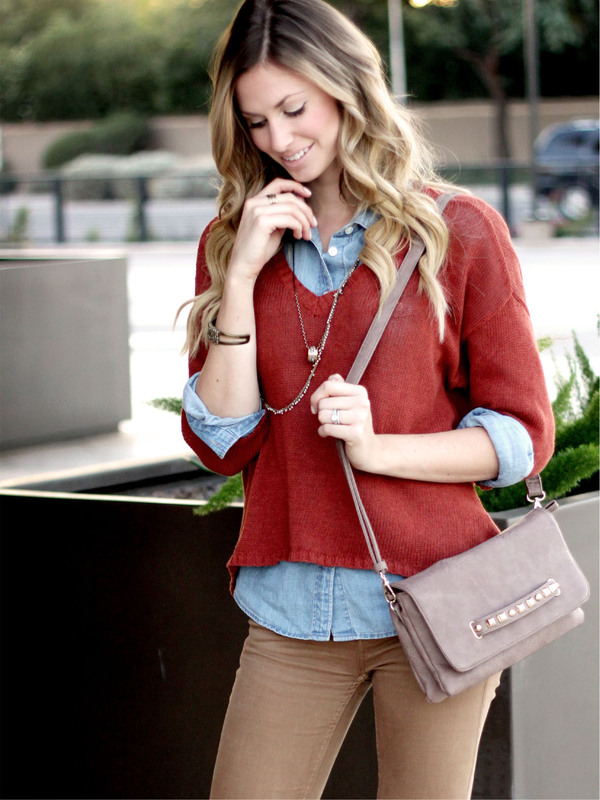 Classy and cute! And don't worry, I'm not above sabotage if it means I get extra dessert!! Hope you had a great day! Hope you sabotaged that pie!! and got every last bite!!!! Happy Thanksgiving and you look absolutely gorgeous! 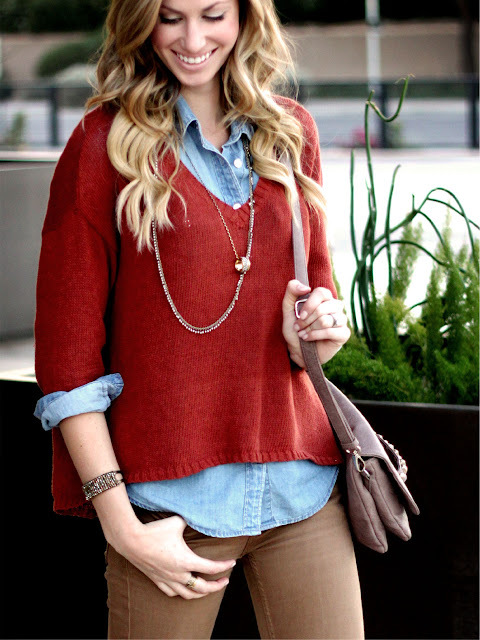 Love the red sweater - perfect for the holidays! I am currently obsessed with the look of bell bottoms, they are so flattering!